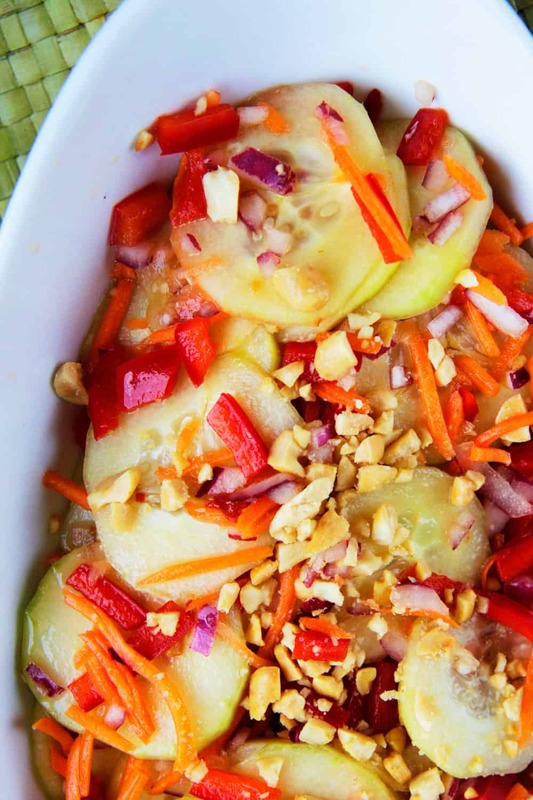 Thai Cucumber Salad Recipe spiked with Red Chili Soy Vinaigrette is flavorful, refreshing, easy and the perfect companion to all your Asian dinners or stand-alone-delicious! 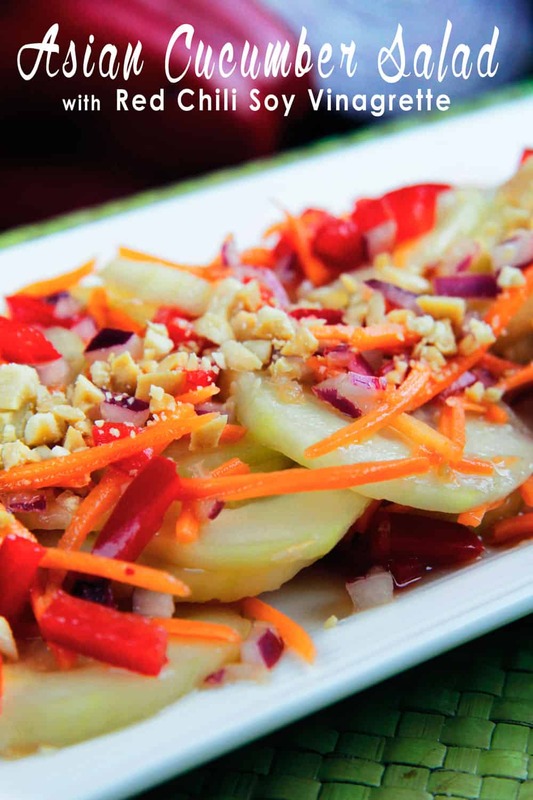 This Thai Cucumber Salad recipe is not only bursting with chilled cucumbers but carrots, bell peppers and red onion for a popping fresh crunch, but the real star is the Red Chili Soy Viniagrette. 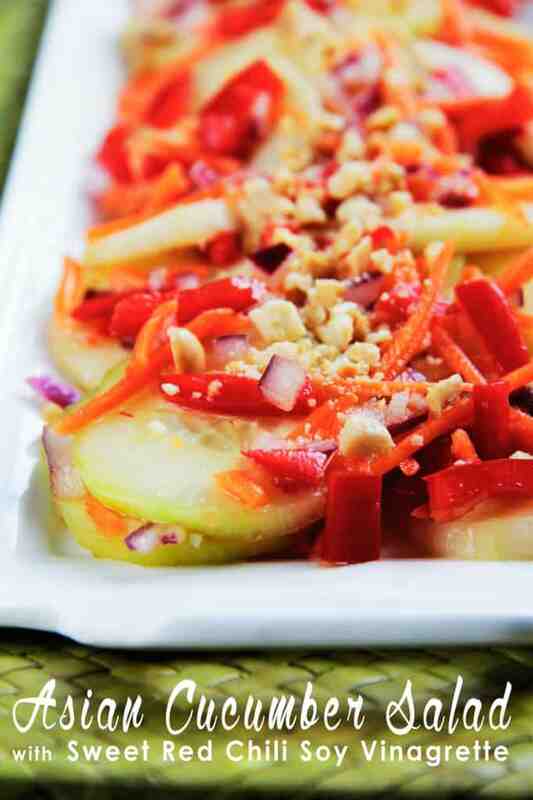 It infuses the Asian Cucumber Salad Recipe with a sweet and savory zing that is simply irresistible! Do you ever get so distracted that you completely miss your exit? or burn the cake in the oven? or peel a cucumber because you think its zucchini? And that is why all these cucumbers are peeled. Which turned out to be a good thing because once I peeled my cucumbers and finally got off the phone to realize that my cucumbers were in fact, not zucchini, I needed to use them right away which means you get this Thai Cucumber Salad Recipe with Red Chili Soy Vinaigrette sooner rather than later! And I know my dear friend Taralynn has been asking for this recipe – so she would prefer sooner! And I know you would prefer sooner too because this cucumber salad is so easy, tasty and refreshing, it will probably become your favorite Asian side dish, or simply your favorite salad! Taralynn first tasted the deliciousness that is this salad a while back when we had her and her husband over for dinner. I served them my insanely delicious Skinny General Tso’s Chicken aka My Favorite Chicken Ever! – because it is my favorite chicken ever! She also wanted that recipe. So what do you serve with General Tsos’s Chicken that won’t compete but compliment? but can still stand on its own? 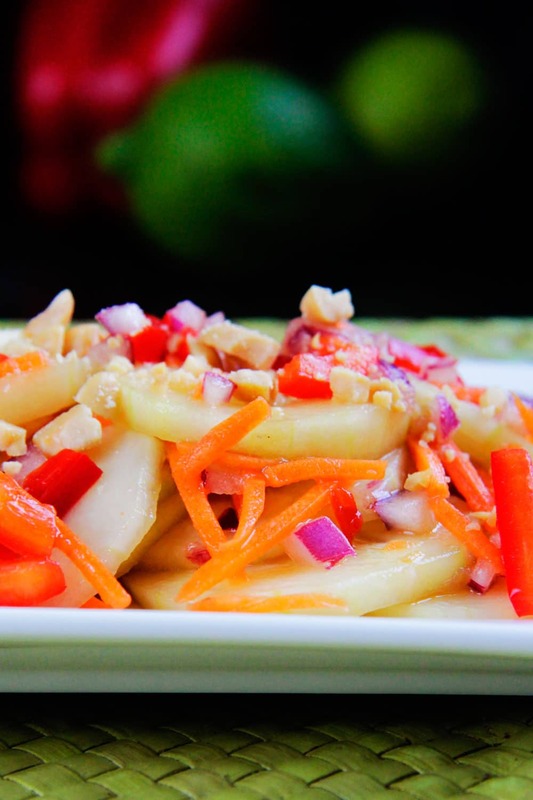 This Thai Cucumber Salad Recipe! Unlike a lot of salads, this salad is marinaded in a vinaigrette so the dressing/salad is almost zero fat! A vinaigrette of Thai Red Chili Sauce, soy sauce, rice vinegar, sesame oil, lime juice, ginger, garlic and a dash of sugar. Can you taste it now?! 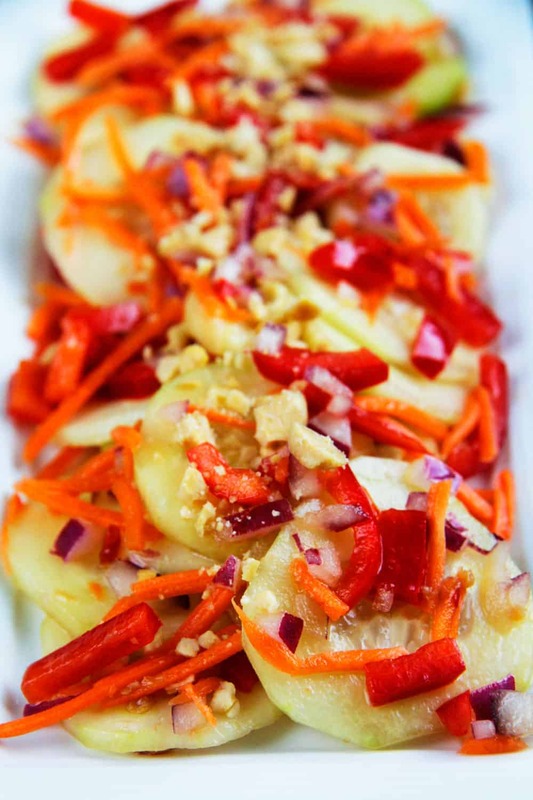 As the cucumber, carrots, bell peppers and red onion slumber in the marinade, they soak up the Asian flavors for a subtly sublime taste and a a not so subtle crunch of thinly sliced cucumbers, matchstick carrots, red bell peppers and peanuts. This Asian Cucumber Salad Recipe is cold, crisp, refreshing, with a slight zing from the chili sauce. 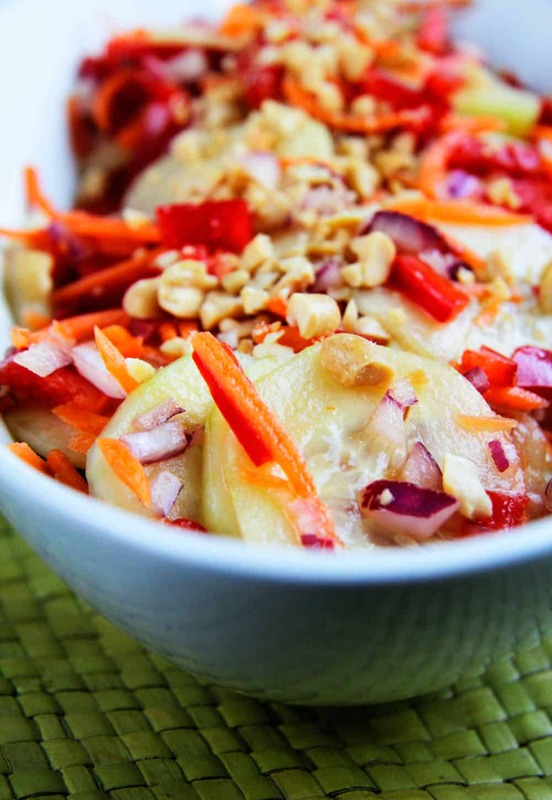 Its a great side dish, or anytime dish. I actually just love eating it by itself because this Thai Cucumber Salad Recipe can stand on its own! Warning: its deliciousness might distract you. Want to try this Thai Cucumber Salad Recipe? 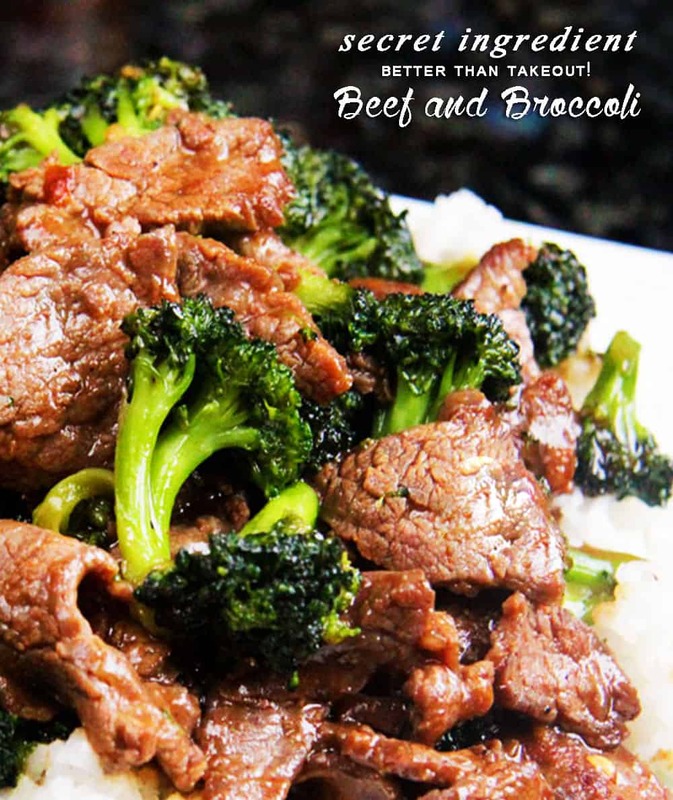 Pin it to your ASIAN or SALAD BOARD to save for later! Whisk Dressing ingredients together in a large bowl. Add salad ingredients and toss to coat. Chill 1 hour before serving. When ready to serve, toss well. Garnish with chopped peanuts. The cucumbers will release some of their water as they marinate - so be aware that the vinaigrette will increase the longer the cucumbers marinate. *Can be found in the Asian section of any grocery store - it also makes a great dipping sauce for anything Asian! This is such a great refreshing salad! So pretty too! Pinning! My pleasure, Tina! Thanks for stopping by! This sounds absolutely delicious. I love the coolness of the cuke and the kick in your marinade! Looks so YUMMY! Wonderful pictures. Looks like you eat it right off the page :)Great job! Thanks so much Misty, that is a huge compliment! What a fresh and vibrant dish! I love it! I can’t wait to make this salad. It looks amazing…. This sounds so fantastic! I love all the flavors and love that it’s healthy! Nice twist on the regular old boring lettuce salad! Thanks Risa – a lot less chopping too! What a yummy and refreshing salad. I know my family will just love it. Thanks Neva. I hope you family loves it too! Its great for summer! I love everything about this! Thanks for sharing!! Thanks Marion, my pleasure! Thanks for stopping by! G’day! Looks delicious! Wish I could try now! Thanks Dawn! You are so right – can’t go wrong with cucumber salad! Making this for a BBQ tomorrow. Just whipped up the dressing and it’s taking all of my self control to not make the salad and eat it all today! What a great idea to bring this to a BBQ! I admire your self control 🙂 Enjoy! 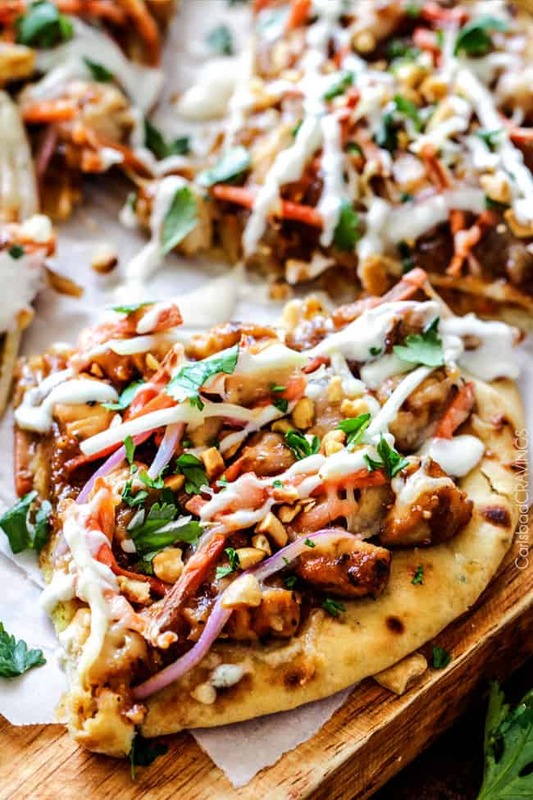 Delicious recipe!I made it last night and just loved it. It will go in the cucumber recipe rotation once the cucs grow! That’s awesome Karen! And that’s so cool you grow your own cucumbers! Thank’s for letting me know you loved it!!! I made this yesterday with my Spiralizer. It is insanely delicious and so visually appetizing to look at. Thanks for another great recipe! You are so welcome Lynn! I bet this is absolutely beautiful with a spriralizer – I am tempted to redo the pics with that! Thank you for trying my recipes and I love your comments!